The doors opened at 8 a.m. at Bull Moose Music in North Windham on Saturday, April 21 for Record Store Day. I had never been before; I did not know what to expect. I was there more than an hour before the official start and was fourth in line. It was a very cold April morning, but as it got closer to the start of Record Store Day, the line grew longer. The first Record Store day was held on April 19, 2008 at all Bull Moose Music locations in Maine and New Hampshire. This is an event that takes place in some form or another on every continent except Antarctica. The idea came in 2007 as a way to celebrate the culture surrounding independent record stores throughout most of the world. It’s a day celebrating the record store; there are special vinyl and CD releases and promotional products all created just for this day. There are also live performances, cook-outs along with artist meet and greets. It’s fun for anyone who enjoys music. As I continued to stand in line for what was an exceptionally long, cold hour, I listened and talked to those around me and realized that we all have one thing in common: a general interest and love of music. We talked about what we planned to purchase when the doors opened, what bands we liked and what concerts we’d seen. As soon as the doors opened, the small line I’d been standing in turned into a crowd of excited music seekers, ready to see what treasures they could find – though I noticed most people had a list of several items. With a purchase you received a Record Store Day tote bag and a hand drawn poster. This was attendee, Mark Ricci’s third Record Store Day. He is a vinyl collector and has been collecting since the mid-60s. He’s been listening to vinyl all his life and prefers the sound to streaming or CDs. He came for The Rascals Record Store Day exclusive vinyl and found it. 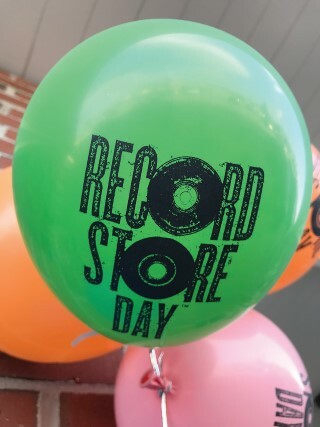 Record Store Day was a great opportunity to find that exclusive vinyl or specialty item only available on this day as well as meet and talk with other music lovers.